Elegant Siopa Rince dress, made for tall dancer. 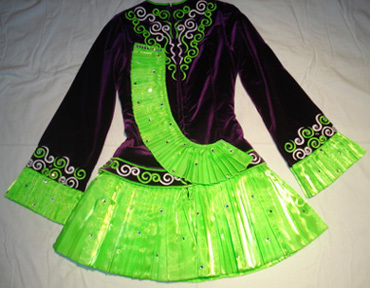 Purple stretch velvet body & sleeves with dropped waist, lime green matte satin skirt & cuffs in 1/2″ pleats, trimmed with lime green and white embroidery and several hundred Swarovski crystals. Skirt lining is patterned silver with crinoline interior skirt. 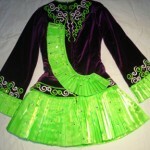 Dress is in excellent condition, very clean, no stains–dancer did not spray tan. Spankies and headband included. 1- 1.5 inches to let out and about 1 inch to let down.